Check out this "AMAZING" SILVER AGE Spider-Man ACTION page, which was penciled by the great John Buscema, and inked by the equally great Jim Mooney, from the CLASSIC "LIZARD" story titled: "The Lizard Lives!" This nice page features Peter Parker leaping out of bed as he hears a radio report that THE LIZARD is causing havoc in New York City! 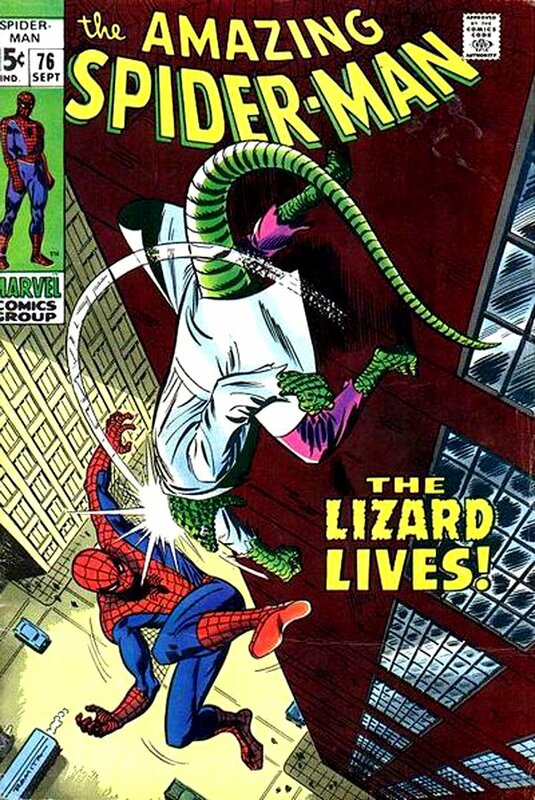 We see THE LIZARD in panel #3 toppling over a car..and then we get 2 AMAZING LARGE panels of Spider-Man in GREAT poses as he sees the destruction below, and then he hangs from a wall looking down at 2 guys about what happened, with VERY funny classic Stan Lee written Banter! Not many times will you get Peter Parker "AND" Spider-Man both drawn on the same page! *****As an EXTRA BONUS....Stan Lee signed the page in blue ballpoint pen in lower left area outside of the drawn artwork. 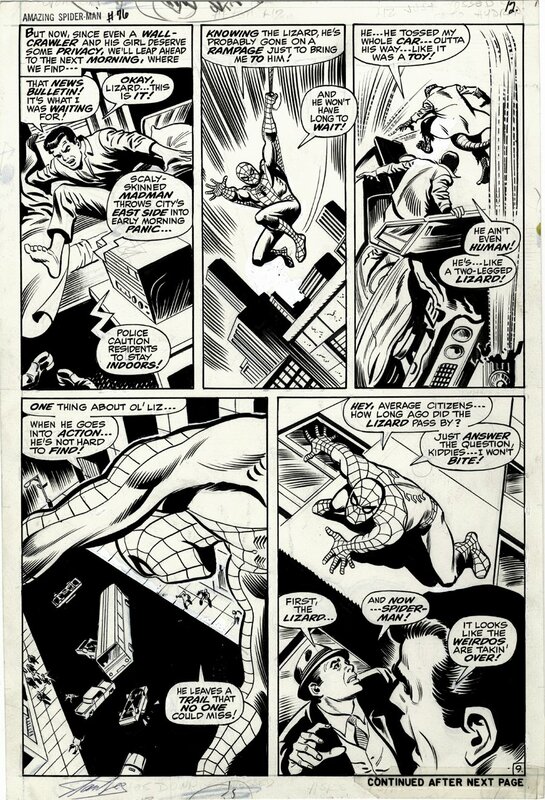 **** SILVER AGE "AMAZING SPIDER-MAN" art pages are VERY hard to find in the hobby these days, so don't miss out on a great opportunity here to own a nice (PRE-ISSUE #100) SILVER Age 1960s "AMAZING SPIDER-MAN" action page! ALL art on our website (including this one) are able to be purchased with VERY fair time payments, and trades are always considered towards "ANY" art on our website! Just send us an email to mikeburkey@aol.com and we can try to work something out.